If you're not in the Kansas City area, there is sure to be a march near you. A lot of scientists will tell you that genetically modified foods are perfectly safe. But ask them about how safe it is to eat Roundup® Herbicide, because that's what's dumped all over your "safe" GMO corn, soybeans, and any other "Roundup® Ready" GMO seeds that end up on your dinner plate. They led us to believe that Monsanto's GMO corn seeds would be naturally resistant to weeds. What they meant was that Monsanto's GMO seeds would be able to survive being drenched with large amounts of Monsanto's Roundup® Herbicide, which kills everything else all around it (but not your food). It was not a big surprise to many when weeds started to become resistant to the Roundup® they were dumping all over the crops. So farmers had to use more Roundup®. And more Roundup®, and more Roundup®. Monsanto's profits soared as farmers couldn't get enough of their plant poison to keep the superweeds at bay. 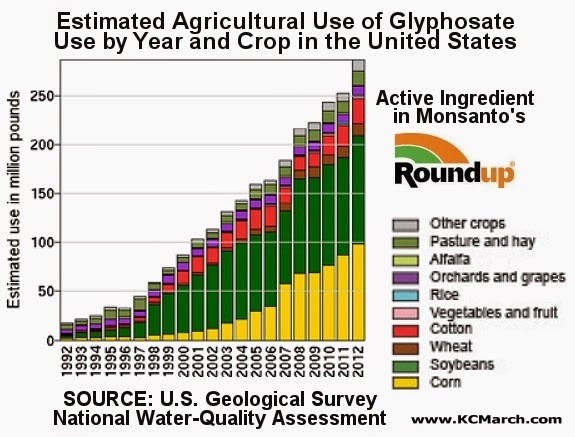 And because so many of the GMO grains that get soaked with Roundup are used to feed our livestock, humans are ingesting Roundup not only in the GMO foods that we eat, but from the meats we eat as well. When the World Health Organization recently proclaimed that Glyphosate, the chemical that makes Roundup® toxic to everything but GMO crops, probably caused cancer, Monsanto went on the defensive. Here's a GMO advocate telling us that you can drink it from a glass and it wouldn't hurt you. Watch the way he backtracks when he's offered a glass of glyphosate to drink, himself. Naturally I prefer foods that didn't grow up being constantly sprayed with poison, but that's only one of many reasons I'll be Marching Against Monsanto again this year. Soon we'll talk about the bee population, and the dwindling thereof. Over the coming weeks we're going to need lots of help getting the rally together and putting the word out! Please visit www.KCMarch.com and find out how you can get involved, but most of all tell your friends and try to be at a march near you! If there's not an event scheduled in your area, there's still time to organize one, so don't be afraid to step up to the plate!